HomeVolume 6Issue 1The Moral Act of Attributing Agency to Nonhumans: What Can Horse ebooks tell us about Rhetorical Agency? ­­The hyperbolic language used to express emotion at the end of a beloved account is nothing new; social media, particularly Twitter, allows for gut reactions to be published and recorded, often resulting in over-the-top rhetoric. 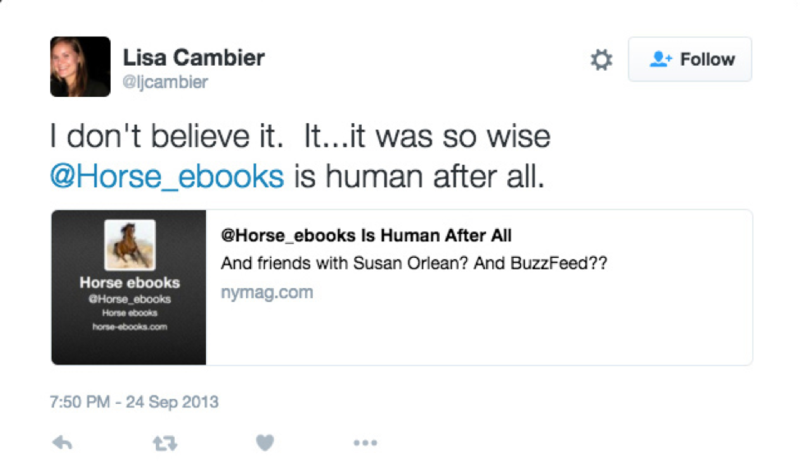 What is curious about the reaction to Horse_ebooks is that fans were upset because they believed they had invested attention and emotion to a Twitter bot, and the reveal that it was a human betrayed their trust. Noteworthy about this case for rhetorical studies is what it exposes about our relationships to technology and our willingness or reticence to attribute agency to nonhuman actors. To say that rhetorical agency has been a hot topic for discussion in the last decade is an understatement (Campbell; Cooper; Davis; Miller; Pflugfelder; Rickert). In these discussions, traditional notions of agency as a rhetorical element that requires a stable autonomous agent or even a rhetorical situation as described by Lloyd Blitzer has been challenged. Agency, instead, is a type of relational energy, persuadability, or affectability that emerges from the convergence of various factors, human and nonhuman, conscious and non-conscious, including the material conditions that make possible the emergence of a rhetorical event. This redefinition of agency has made possible extended considerations of rhetoricity in objects (Barnett), hardware and software (Brown), and nonhumans in general (Brown and Rivers; Miller; Rickert). Such reconsiderations of agency alongside investigations of nonhuman rhetoric are part of a paradigm shift in rhetoric studies, to say the least. No longer can one presuppose rhetorical agency as a solely human trait or capacity and as dependent upon the subject/object split that has defined rhetoric in decades past. Of course one of the great challenges to this paradigm shift is ethics. Typical understandings of agency enable rhetoricians to attribute cause, and therefore blame and praise to particular agents of a rhetorical act. However, if agency is distributed among various actants, as Bruno Latour or Jane Bennett would put it, then it can be difficult to pass moral judgment on any particular rhetorical agent. For this article, in the hopes that more researchers in the field of rhetoric will investigate the relationship between ethics and nonhuman rhetorical agency, we offer up a strange, entertaining case study: the curious case of Horse_ebooks. This case exposes the tension between two diverging theories of nonhuman rhetorical agency—those from Carolyn Miller and Thomas Rickert. In the end, we argue that yes, Miller and Rickert disagree on how agency emerges in a rhetorical event (for the former it emerges through attribution; for the latter it is always already present), but attributing agency (whether to a human or nonhuman) is a moral and an emotional act, even if agency precedes the attribution. In other words, viewing the attribution of agency as a moral act and understanding agency as an always present ambient affectability are not mutually exclusive positions. The account inspired fan fiction and merchandise, poetry and artwork, and in barely more than a year of existence, Horse_ebooks attracted over 40,000 followers. Chen attributed the popularity of the account to its refreshing randomness, “embraced like a life-preserver by internet users drowning in a sea of painfully literal SEO headlines and hack Twitter comedians.” In other words, it was popular because it didn’t appear to be trying to say anything. With the exception of a few links to ebooks about horses here and there, it didn’t even appear to be trying to do anything. It was simply a complacent, nonhuman existence, received as “zen” wisdom by humans across the Internet. Since its appearance in August 2010, debate swirled around the Twitterverse and blogosphere as to the nature of the mysterious horse. Was it a spambot as it seemed? Was it a clever human tweeting whatever random thoughts s/he had, however unfinished and incohesive? Chen’s Gawker article appeared to end all debate, revealing that the account was, in fact, a spambot, created to market an ebooks website. The account was programmed to pull and post random selections from the ebooks available for purchase. Most of the tweets’ content was not direct marketing; rather, the programmer’s intention was that by following other Twitter users, the account would draw attention to the website and the ebooks found there. Despite this revelation, or perhaps because of it, the account increased in popularity. Tweets from fans ranged from delighted confusion to pure adoration on a daily basis, and the number of followers jumped from 40,000 to 200,000.
because at the time I had been drinking and I thought him a spirit animal. and snuffling into bags of corn chips. I asked him once, over salsa, how he came to be this way. and he tossed his luxurious mane and flashed his enormous gums. would cure my stress eating. Unbeknownst to Adrian Chen, Ricky Davis, or the soon-to-be 200,000 other followers, the Horse_ebooks account had been purchased from the spambot programmer in September 2011 by Jason Bakkila and Thomas Bender as part of an art project. Instead of using the algorithm, Bakkila took over the account and began pulling tweets from random places around the Internet himself, actively trying to find half-sentences that still carried the signature Horse_ebooks enigma. He even kept odd hours to mimic the bot’s regular schedule; “he could have made a lot of tweets and programmed them to be time-released, but he decided to post in real time, because, as he put it, ‘I wanted to preserve the integrity of bespoke spam’” (Orlean, “Man and Machine”). Many fans had noticed that on September 14th, 2011, the account stopped posting “via Horse_ebooks” and started posting “via web,” and that the tweets became more poignant in their randomness and less concerned with sending links to the ebooks. This had ignited theories that the creator had returned to take over, or had at least readjusted the algorithm to pull from places outside of the ebooks. Despite this, most followers were quite happy to accept the account as a nonsentient bot, some tweeting “I love you” tweets on a fairly consistent basis. Two years after the takeover, the journalist Susan Orlean, with full permission and cooperation from Bakkila and Bender, exposed the humans behind the account, setting off a virtual storm in the Twitterverse. While a few followers responded with indifference or insisted they knew it was a human all along, many were quite upset, with emotions ranging from despair to anger. Some more verbose followers wrote extensive obituaries in blog posts, treating the end of the project as a death, not just of the account, but of the possibility for a nonsentient being to produce art or, as rhetoricians might put it, express agency. Even now, two years after the reveal, fans send tweets to Horse_ebooks reminiscing and begging it to return. Hyperbolic as these tweets may be, what these reactions reveal is that people were emotionally invested in attributing agency to a nonhuman entity, and when it was revealed to be a human entity, these people felt betrayed. Followers interpreted Horse_ebooks’ words as wise and poetic, seeking advice and finding meaning, recognizant of the impact this bizarre account’s words had on their lives. They did this believing, even wanting to believe, that the account was a bot. For these tweeters, a human behind Horse_ebooks cheapened the wisdom and poetry. So what can rhetorical theory tell us about the Horse_ebooks phenomenon? As we state above, two of the more influential, prominent, and potentially opposing positions on nonhuman agency come from Carolyn Miller and Thomas Rickert. While their terminologies differ, both agree that agency is neither located in nor owned by an autonomous rhetor; both agree that agency is something that is located in (or emerges from) rhetorical events, situations, or environments; and both agree that agency is not bound up in human choice or intentionality but rather in rhetorical capacity, effectivity, and (particularly for Rickert) affectivity. As is evident in the Horse_ebooks story, we can clearly see agency emerging via the convergence of many human and nonhuman elements rather than as a quality of an autonomous rhetor. However, Miller and Rickert disagree on how agency comes into being in such rhetorical events and environments, and in a sense, the case of Horse_ebooks supports both positions. In her essay, “What Can Automation Tell Us about Agency?” Miller claims that agency is a kind of kinetic energy that is bound up in relationality and attribution. She suggests “that we think of agency as the kinetic energy of rhetorical performance” (147). Understanding agency as kinetic energy, Miller notes, means that agency is not something that precedes the rhetorical event but emerges within the performance or event as a property of that event and also a “property of a relationship between rhetor and audience” (150). Derived from the Greek notion of ethopoeia, or the creation of character in discourse, agency requires two things to exist: (1) mutual attribution and (2) the capability and willingness to attribute agency to another being. “To produce kinetic energy,” Miller argues, “performance requires a relationship between two entities who [can and] will attribute agency to each other” (149). This attribution of agency, for Miller, is an acknowledgment of subjecthood for the attributed and therefore an ethical act, a moral judgment. Miller concludes, based upon the results of a questionnaire given to speech instructors about the use of a fictional automated speech assessment technology, that humans are hesitant to see such an agential performance in anything other than human-to-human relations. Nevertheless, in the case of Horse_ebooks, we see mutual attribution of agency as inclusive of a nonhuman entity, as users tweeted about getting a follow from Horse_ebooks or tweeted their frustration that the illusive horse had not yet followed them. Of course, Rickert rightly concedes that Miller does not deny the rhetorical agency of nonhumans. However, he disagrees with Miller’s conditions for the existence of agency, namely the mutual attribution of agency. This relies too heavily on anthropocentricity, Rickert argues (202), and leaves no room for understanding nonhuman rhetorical agency beyond a reinvigorated interest in “context, setting, the rhetorical situation, and so forth” (210). Rickert, of course, draws upon Martin Heidegger, Bruno Latour, and Jane Bennett to recognize nonhuman rhetorical agency, acknowledging that nonhumans have agential capacities beyond humans’ attributions. Rickert is not looking to establish nonhuman agency as equal to human agency or as derived from simplistic notions of causation (211), rather, he wishes to posit agency in terms of the affect and persuadability that precedes rhetoric. This agency is not found in a sole element but in an “ensemble of [human and nonhuman] elements” that affect or transform how we inhabit [a] space” (160). This is obviously the case with Horse_ebooks in that users’ existences in the Twitterverse were changed by a bot, which was impacted by the medium, which is constantly reshaped by the users. Rhetorical action emerged from the convergence of all of these elements and more. Thus, Rickert is right that it is insufficient to understand rhetorical agency as requiring attribution. If human attribution “trumps all” (212), then we are neglecting the important “collectivity of interacting elements, energies, and forces, human and nonhuman” that constitute rhetoricity. Rickert does acknowledge that focusing on attribution is important, but he argues that to focus on it solely is too reductive and a small part of rhetorical agency (212). Nevertheless, while Rickert notes that “attribution is a genuine issue” (212), he spends very little if any time in Ambient Rhetoric discussing it directly. This leaves open, of course, the idea that attribution is important, even if we might agree with his argument that nonhuman agency precedes and exceeds human attribution. Afterall, Rickert’s entire project is centered around adopting orientations that allow the actual and potential agencies of nonhumans to emerge or to be intuited. Arguably, this could be viewed as attributing agency. Thus, while Miller’s ontological claims about nonhuman agency seem to be in question, her position that attributing agency is a moral act is still quite convincing. Our point is that Miller’s argument that the attribution of agency is a moral act and Rickert’s argument that agency is always already present are not necessarily opposed positions. In fact, as we can see in the case of Horse_ebooks, these two claims are complementary. The emotional commitment fans of the Twitter account displayed before and after the reveal supports Miller’s claim that the attribution of agency is an ethical act, a moral judgement—an act that produces a sense of wrongness when it is betrayed. At the same time, the rhetorical situation of interconnected bot-human-medium relationships also supports Rickert’s idea that agency is not just with the human or just with the bot but is potentially found in the convergence of all the involved elements, with or without attribution. Attribution is still an ethical act, but the emergence of agency precedes and exceeds such an attribution. Understanding this difference is important, as such an acknowledgment of this ethical exigence may be the very thing that sustains engagement with nonhuman rhetoric for years to come. Some have already identified an ethical exigency in simply including nonhumans in rhetorical analyses (e.g., Rivers). We suggest that our ethical exigence not stop at recognizing how nonhumans co-constitute a rhetorical event, as the specific act of attribution clearly made an impact on human lives and the way the bot functioned in the case of Horse_ebooks. We are emotionally and morally invested in attributing agency, even to nonhuman actors, and because of this, it’s important that we also learn to be guarded and cautious about the engagement. We should be expanding the spectrum of agency but be cognizant of the moral aspects of attributing that agency. For Rickert, it may not be important whether or not we attribute agency, as everything has the capacity for rhetoricity. Horse_ebooks produced change in human followers, both as a bot and as a human, whether or not Twitter users acknowledged it. Contrary to Miller’s argument, many people are not afraid to attribute agency to nonhumans; consistent with her stance, such an act is by no means trivial. The attribution of agency is a moral act, and we do care about where, to whom, and to what we attribute agency. The lesson many of these users learn from the reveal is to be more guarded about attributing agency, as Miller recommends (153). As we can ascertain from the Horse_ebooks case study, most of us are already aware on some level that attributing agency is an ethical act and a moral judgment. Moreover, whether we are aware of it or not, such an attribution and the nonhuman agencies preceding and exceeding it are not mutually exclusive. Ignoring attribution in a rhetorical analysis would be just as insufficient as focusing solely on it. Acknowledging these characteristics of agency within the fields of rhetoric is what will sustain our engagement with the nonhuman in a productive and appropriately inquisitive direction. #1 good boy. @secondratesaint. “was thinkin about @horse_ebooks and got real sad :(.“ 7 Aug. 2014. Tweet. 30 Oct. 2015. Ann, Kristen. @kkristenann. “@Horse_ebooks wtf are you? I don’t care though. I love you.” 16 Feb. 2013. 12:08 AM. Tweet. 30 Oct. 2015. Barnett, Scot. “Toward an Object-Oriented Rhetoric: A Review of Tool-Being: Heidegger and the Metaphysics of Objects and Guerrilla Metaphysics: Phenomenology and the Carpentry of Things by Graham Harman.” Enculturation: A Journal of Rhetoric, Writing, and Culture 7 (2010). n. pag. Web. 18 January 2016. <http://enculturation.net/ toward-an-object-oriented-rhetoric>. Becket, Stefan. @becket. “@Horse_ebooks I hope they make you into glue.” 24 Sept. 2013. 7:13 AM. Tweet. 30 Oct. 2015. Bennett, Jane. Vibrant Matter. Durham: Duke University Press, 2010. Print. Blackhart, Joanna. @JoannaBlackhart. 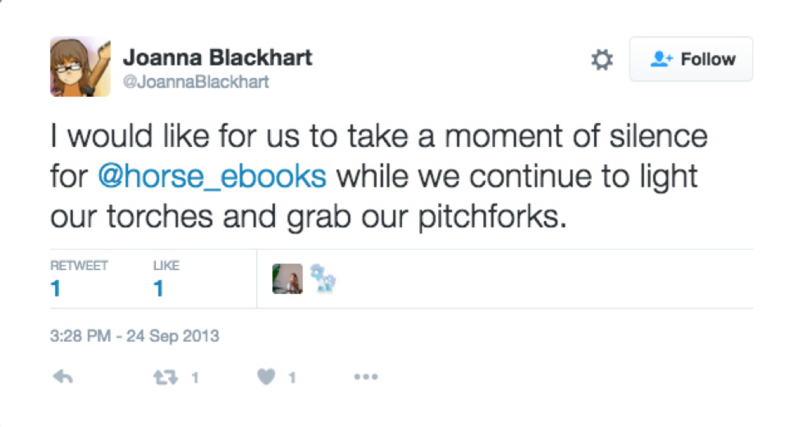 “I would like for us to take a moment of silence for @horse_ebooks while we continue to light our torches and grab our pitchforks.” 24 Sept. 2013. 3:28 PM. Tweet. 30 Oct. 2015. Blitzer, Lloyd. “The Rhetorical Situation.” Philosophy and Rhetoric 1:1 (1968): 1–14. Brennan, Tola. @tolabrennan. “@Horse_ebooks is dead to me. #betrayed.” 24 Sept. 2013. 12:10 PM. Tweet. 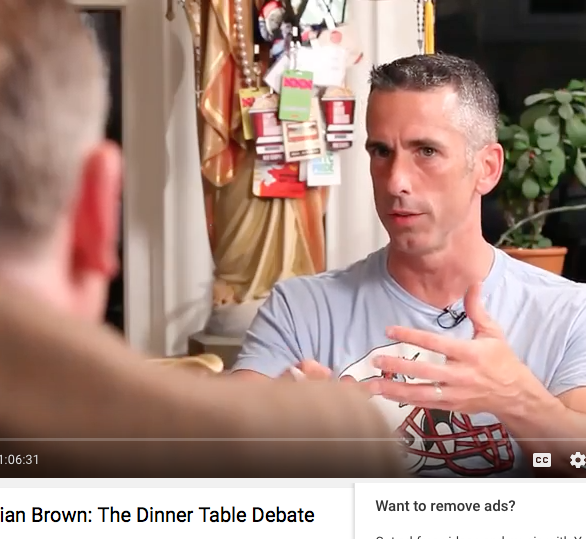 30 Oct. 2015.
brown, drew. @drewfoundland. “omg @Horse_ebooks is following me this is the best christmas ever. i love you horse book.” 19 Dec. 2011. 10:05 AM. Tweet. 30 Oct. 2015. Brown, James J. Jr. Ethical Programs: Hospitality and the Rhetorics of Software. Ann Arbor: University of Michigan, 2015. Print. —. “The Machine That Therefore I Am.” Philosophy and Rhetoric 47.4 (2014): 494–514. Web. 18 Jan. 2016. Brown, James J. Jr. and Rivers, Nathaniel. “Composing the Carpenter’s Workshop.” O-Zone: A Journal of Object-Oriented Studies 1 (2013): 27–36. Web. 18 January 2016. Cambier, Lisa. @ljcambier. “I don’t believe it. It…it was so wise @Horse_ebooks is human after all.” 23 Sept. 2013. 7:50 PM. Tweet. 30 Oct. 2015. Campbell, Karlyn Kohrs. “Agency: Promiscuous and Protean.” Communication and Critical/Cultural Studies 2.1 (2005): 1-19. Web. 18 January 2016. Chen, Adrian. 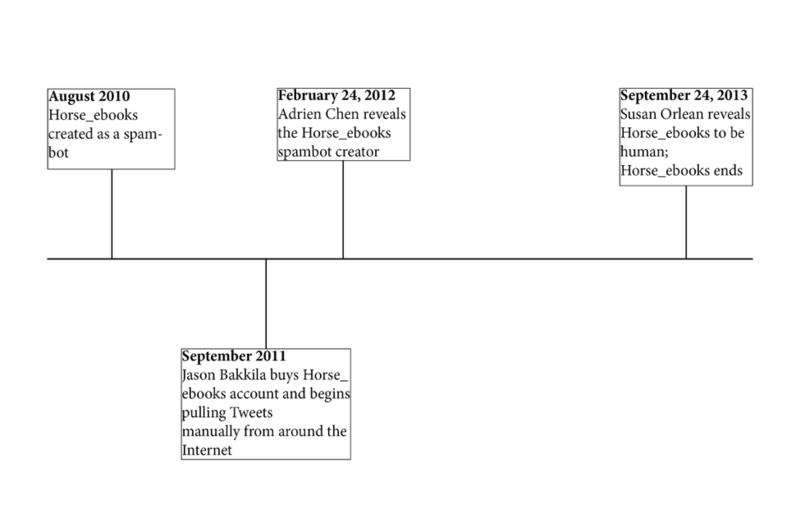 “How I Found the Human Being Behind Horse_ebooks, The Internet’s Favorite Spambot.” Gawker 23 February 2012. Web. 18 January 2016. <http://gawker.com/5887697/how-i-found-the-human-being-behind-horseebooks-the-internets-favorite-spambot>. Clede, Jonathan. @clede. “SO ANGRY at @Horse_ebooks right now!” 24 Sept. 2013. 11:21 AM. Tweet. 30 Oct. 2015.
Cooper, Marilyn M. “Rhetorical Agency As Emergent And Enacted.” College Composition & Communication 62.3 (2011): 420-449. Web. 18 January 2016. Curran. @ItsCurran. “The fact that @horse_ebooks was all a lie still really pisses me off.” 6 Nov. 2013. 4:32 PM. Tweet. 30 Oct. 2015. Davis, Ricky. “Horse.” Poem. n.d. Print. Hannush, J. Andreas. @JulianHannush. “i’ve lost all of my inspiration now that @Horse_ebooks has stopped tweeting.” 24 Sept. 2013. 8:05 PM. Tweet. 30 Oct. 2015. Horse ebooks. @Horse_ebooks. “THE KNIGHT OF THE WHISTLE HE CAN DO.” 21 Aug. 2011. 1:58 PM. Tweet. 30 Oct. 2015. —. @Horse_ebooks. “Don t start a Cupcake.” 19 Feb. 7:01 PM. Tweet. 30 Oct. 2015. —. @Horse_ebooks. “Everything happens so much.” 28 June 2012. 1:23 PM. Tweet. 30 Oct. 2015. Hourihan, Kelly. @Mostlykelly. “Horse_ebooks why do I love you so much you are perfection.” 15 July 2012. 10:42 PM. Tweet. 30 Oct. 2015.
illuminaughty. @kennedylryan. 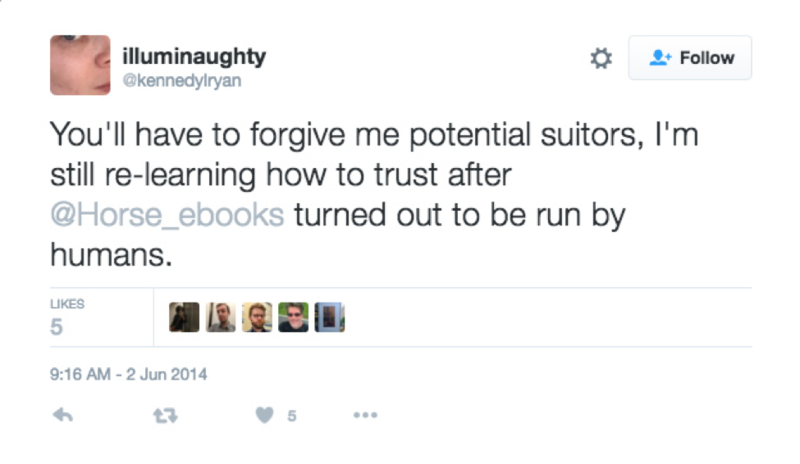 “You’ll have to forgive me potential suitors, I’m still re-learning how to trust after @Horse_ebooks turned out to be run by humans.” 2 June 2014. 9:16 AM. Tweet. 30 Oct. 2015. Imogen. @febreze1995. “I’m so pissed that @Horse_ebooks is fake. I mean some tweets did kind of give it away, but I still wanted to believe in the mindless spam.” 24 Sept. 2013. 7:48 PM. Tweet. 30 Oct. 2015. Ira, Stephen. @supermattachine. “Also, @Horse_ebooks is following me, which is the greatest accomplishment I have yet achieved in life.” 19 Dec. 2011. 4:02 PM. Tweet. 30 Oct. 2015. Jackie. @Snikette. “I wikied and read knowyourmeme and I still don’t understand the hype/appeal of @horse_ebooks.” 4 June 2013. 12:07AM. Tweet. 30 Oct. 2015. Jean, Kellie. @glueyourfingers. 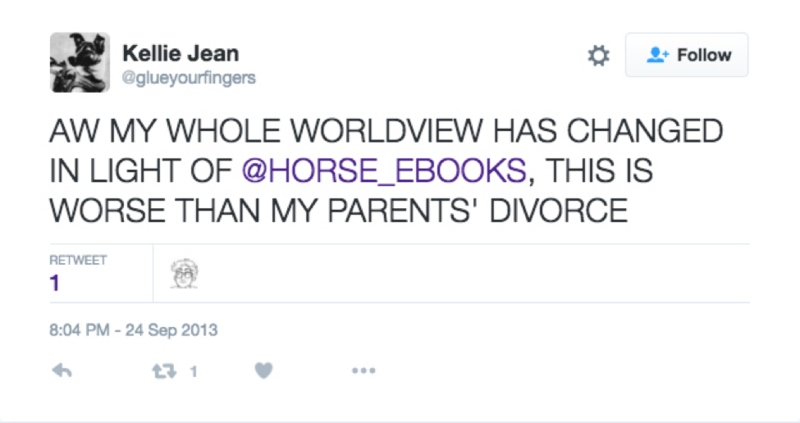 “AW MY WHOLE WORLDVIEW HAS CHANGED IN LIGHT OF @HORSE_EBOOKS, THIS IS WORSE THAN MY PARENTS’ DIVORCE.” 24 Sept. 2013. 8:04 PM. Tweet. 30 Oct. 2015. Jordan. @Jordanade. “@Horse_ebooks It’s not often a bot trying to sell me ebooks about horses on Twitter makes me re-evaluate my philosophies. Good job, horse.” 27 April 2012. 1:12 AM. Tweet. 30 Oct. 2015. Julian. @friendgolem. “@Horse_ebooks you are the greatest oh how i love you.” 26 July 2012. 9:46 PM. Tweet. 30 Oct. 2015.
kee-sha. @KeshiaCheesman. “So sad that @Horse_ebooks doesn’t tweet anymore.” 7 Aug. 2014. 10:09 PM. Tweet. 30 Oct. 2015. Khozoei, Kenji. @mfkenji. “feel genuinely irl upset abt @Horse_ebooks.” 25 Sept. 2013. 7:48. Tweet. PM. 30 Oct. 2015. Melody. @laotralamisma. “@Horse_ebooks I sitll think about how much i hate u.” 25 June 2015. 7:57 AM. Tweet. 30 Oct. 2015. MeMe. @memeisawesome. “I miss the weird, random insights once provided by @Horse_ebooks What an unusual time to be alive. 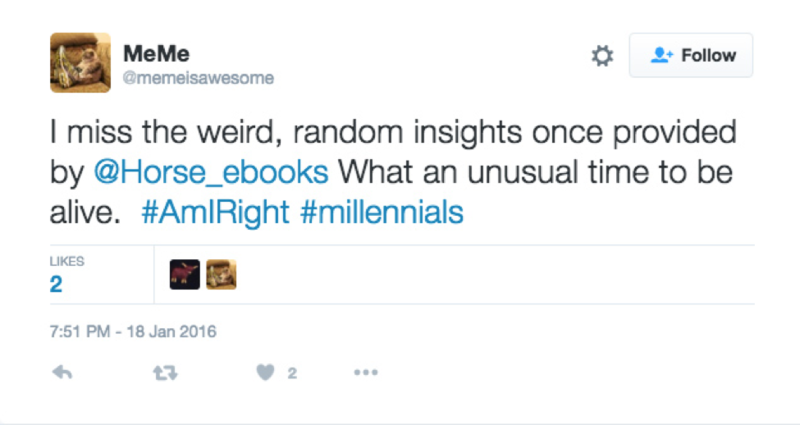 #AmIRight #millennials.” 18 Jan. 2016. 7:51 PM. Tweet. 20 Jan. 2016. Miller, Carolyn R. “What Can Automation Tell Us About Agency?” Rhetoric Society Quarterly 37.2 (2007): 137–157. Web. 18 January 2016.
muffins. @muffinsAKA. “@Horse_ebooks please follow me. please. just please. i need this.” 29 April 2011. 2:22 PM. Tweet. 30 Oct. 2015.
nina. @ohmyg____d. “@Horse_ebooks, I love you so much, and you’re not even real. (Telling? ).” 29 Mar. 2013. 10:26 AM. Tweet. 30 Oct. 2015. Orlean, Susan. “Horse_ebooks Is Human After All.” The New Yorker. 24 September 2013. Web. 18 January 2016. <http://www.newyorker.com/tech/elements/horse_ebooks-is-human-after-all>. Orlean, Susan. “Man and Machine: Playing Games on the Internet.” The New Yorker. 10 February 2014. Web. 18 January 2016. <http://www.newyorker.com/magazine/2014/02/10/man-and-machine-2>. Pflugfelder, Ehren Helmut. “Is No One at the Wheel? Nonhuman Agency and Agentive Movement.” Thinking with Bruno Latour in Rhetoric and Composition. Ed. Paul Lynch & Nathaniel Rivers. Carbondale: Southern Illinois University Press, 2015. 115–134. Print. rad k. @kh4l3n. “PLEASE FOLLOW ME!!! I will become your personal slave, pawn, panzi, whatever! I will do anything to persuade you to follow me.” 22 Mar. 2012. 9:24 PM. Tweet. 20 Jan. 2016. Rivers, Nathaniel. “Tracing the Missing Masses: Vibrancy, Symmetry, and Public Rhetoric Pedagogy.” Enculturation: A Journal of Rhetoric, Writing, and Culture 17 (2014). n. pag. Web. 18 January 2016. <http://www.enculturation.net/missingmasses>. Russell eBooks. @ rsslldnphy. “I don’t understand @Horse_ebooks, but I like it – a lot.” 5 May 2013. 4:09 AM. Tweet. 20 Jan. 2016. Ruth, Emma. @swaggajack. “I miss @Horse_ebooks.” 7 Aug. 2014. 11:18 AM. Tweet. 20 Jan. 2016.
swar, honee. @ hoenieswah. 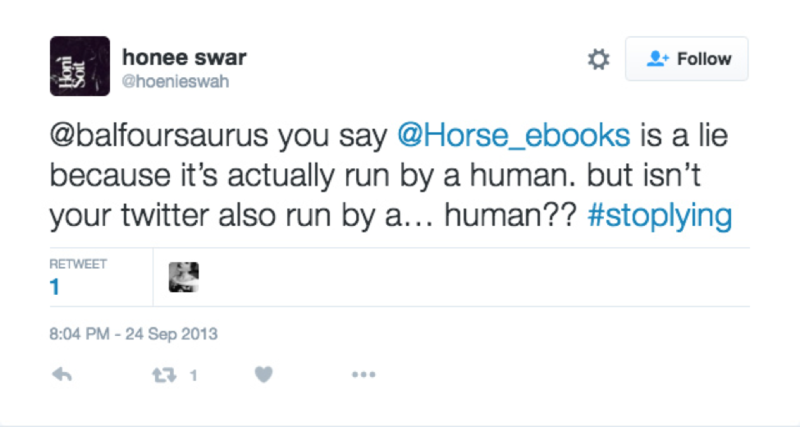 “@balfoursaurus you say @Horse_ebooks is a lie because it’s actually run by a human. but isn’t your twitter also run by a… human?? #stoplying.” 24 Sept. 2013. 8:04 PM. Tweet. 30 Oct. 2015. 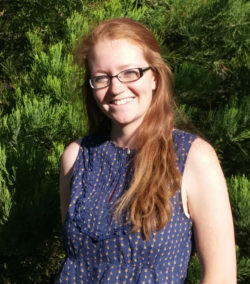 Beth Shirley is a PhD student in the Technical Communication and Rhetoric program at Utah State University. Her research interests include social justice through science communication and environmental rhetoric, how humans engage in conversation about both technology and the environment, and how those conversations overlap. She is interested in the possibilities for interdisciplinary research with scholars in the environmental sciences. 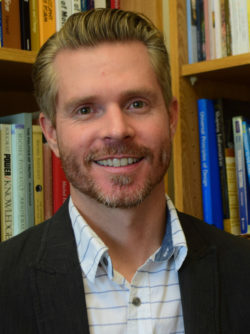 Jared S. Colton is an assistant professor of technical communication and rhetoric at Utah State University. His research addresses the intersections of rhetorical theory, ethics, and politics, whether in pedagogy or sites of social justice. He is particularly interested in how classical and contemporary ethical frameworks inform the production, practice, and critique of collective activism via social and mobile media and accessibility technologies. His work has appeared in the Journal of Technical Writing and Communication, Computers and Composition: An International Journal, the Journal of Interactive Technology and Pedagogy, and other journals.